When you look back to yesterday you start to deduce how little you know right now. I’m looking into the coals of a fire and at the fluttering light and I’m looking at my own time. I can feel the heat reflecting off the fire bricks and onto my cheek as I watch the coals rapidly change in color during my mental trip back in time. At this moment they seem to hold all the answers - or at the very least, enough to satisfy my oxygen deprived brain (I’ve been sitting here for a hot minute). Fire is the theme in Argentina, and I will continue it now: from the fire of Asado to the brew kettles of two breweries in San Luis, Argentina, boiling the ancient wort discovered by ancestors forgotten. 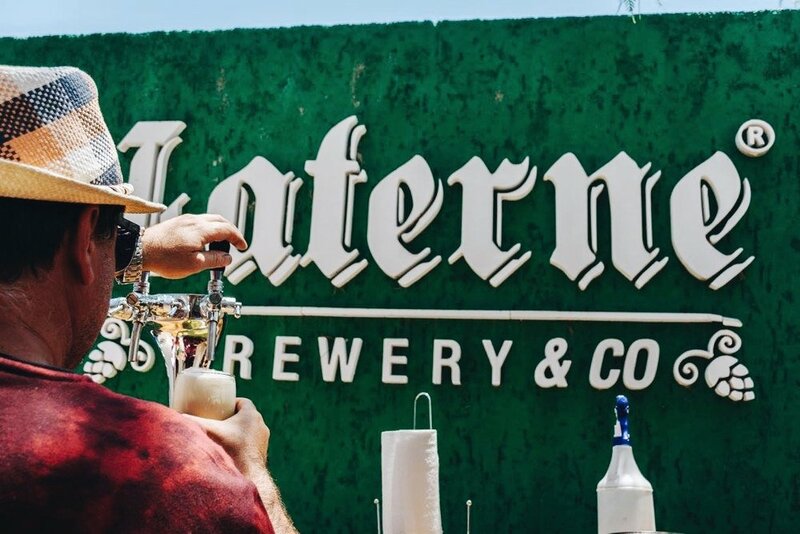 We traveled to San Luis for the beer; to say it was exceptional would short change our hosts, Kerze Brewing and Laterne Brewing. Driving through the sierra of San Luis and into the industrial part of town we parked outside a warehouse with the name Kerze ornamenting the front. The first brewery in town, Kerze had just moved into this new location six months ago. A clean, well-lit room, the taproom showcased the owner, Mario's, affinity for beer glassware; IPA glasses along with a variety of stemmed glasses lined and hung from the wall to the left of the bar. The light above reflected off their various shapes irradiating a dreamlike effulgence, drawing us towards the wooden bar. At the bar, the scene from left to right illustrated to and assured us that the craft beer we were about to order would exceed any expectations: style-conscious glassware, counter-pressure draft system, detailed beer list accompanied by knowledgeable staff, visually-aesthetic branding accompanying each beer, and four medals hanging above their award winning beer. The bartender informed us that Mario was back in the brewhouse so Sara and I sampled a couple beers: a Kolsch and and IPA. The Kolsch, a personal favorite and a style originating from Cologne, Germany, tends to get lost among the lager and wheat beer produced in Germany. Tasting Mario's interpretation of the style made me question why that is: clean, bready-malt taste balanced by subtle fruity esters and a sharp, refreshingly bitter bite. Remaining an ideal session beer, it was more interesting than a lager without exhausting the palate. I was not surprised to hear later on that it is Kerze's biggest seller. The IPA brought me back home in aroma and flavor: citrus fruit on the nose, followed initially by a crisp bite and then toasted bread on the tongue, and finishing with a grassy, citrus American Hop bitterness. It was deliciously balanced, hiding no flaws. We ordered two pints: Kolsch for myself and IPA for Sara. Mario walked through the door leading to the brewery as the pints crossed the bar and into our hands. He shook our free hands and led us back into the brewhouse where his 1400 liter (8-10 BBL) system stood surrounded by several 1000 and 3000 liter fermenters. Street art splashed color on a wall, contrasting with the stark shine of stainless steel and alluding to Mario's creativity and passion for beer. 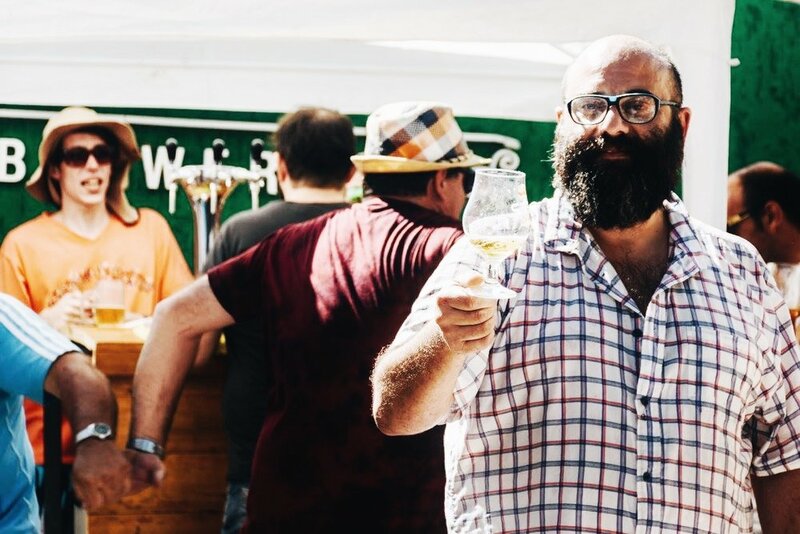 I learned a lot about him as we discussed the art of brewing (and drinking) beer, his thoughts on the brewery business, and his philosophy on work-life balance. Most everyone in the craft beer business enjoys drinking beer; however, Mario's enthusiasm made me wonder if by some miracle of evolution the water in his body had been replaced by a malty, golden liquid. "I only drink beer - no wine," he declared. In Argentina, Malbec mecca, that's similar to a Bavarian preferring a Martini. "I only drink beer, and so I simply can't sell bad beer. I have too much respect for it." This reflected in the superior flavor and quality of his product, but also in the way he lives his life and runs his business. 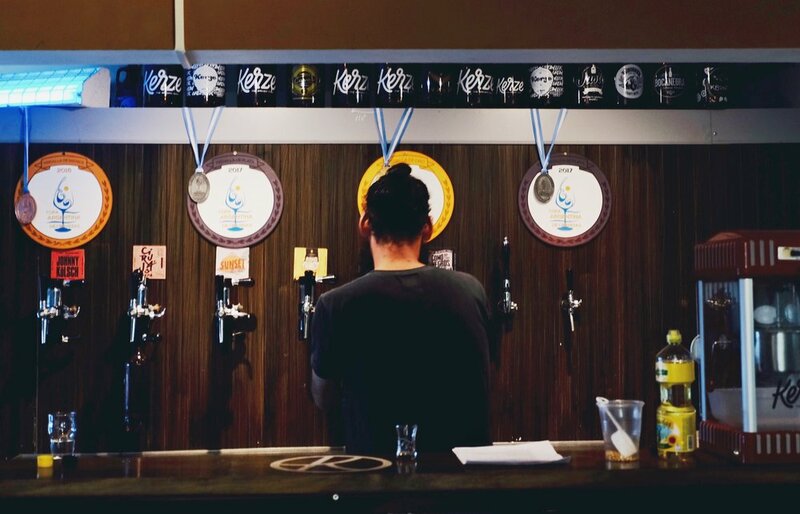 His thirst for beer knowledge matches that for the drink: he recently became a Certified Beer Judge and, this year, is making the trip up to Nashville, Tennessee for the Craft Brewer's Conference. 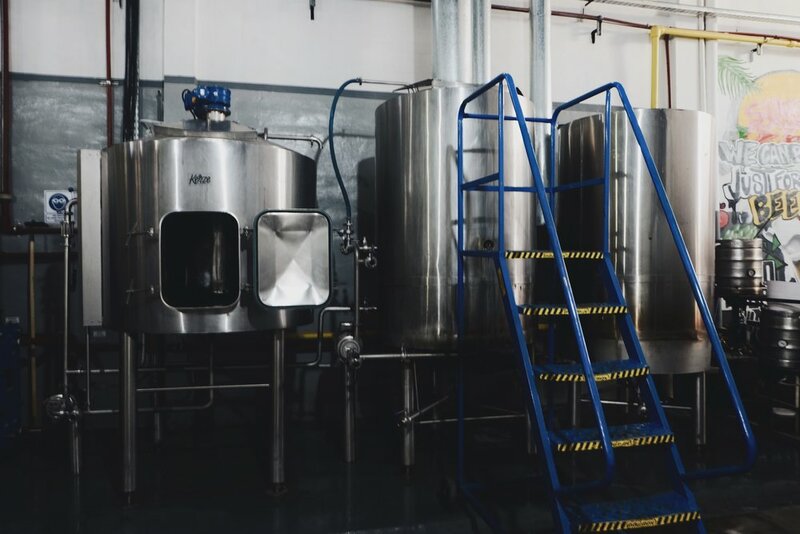 His business has grown organically and meticulously in an effort to maintain control of Kerze's direction as a brewery and to guarantee the production and sale of only the highest quality beer. His children frequently play upstairs among the bags of malted grain. Near the mill I asked him how he transfers the grain to the mash tun. "We carry it," he replied with a sardonic smile. As the brewery continues to grow every year and responsibilities expand, Mario, the artist and lover of all things malty and carbonated, can't bear to pull himself away from the brewhouse. And he probably won't - nor should he. 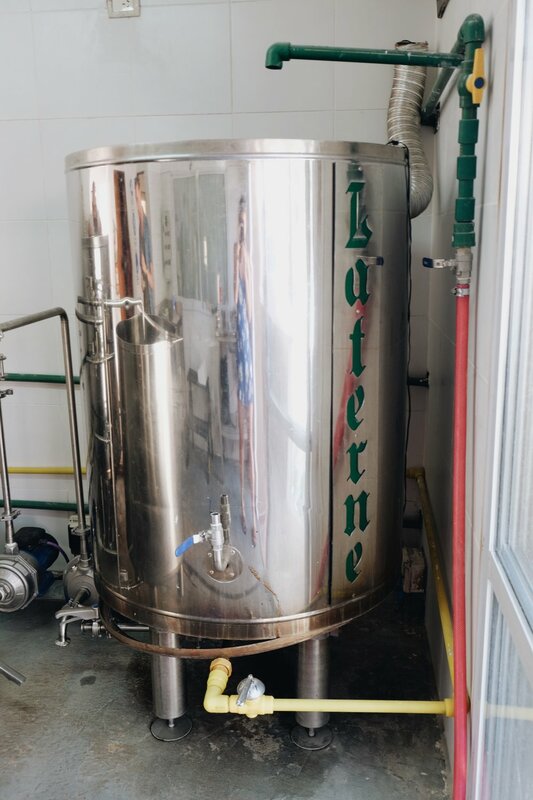 The second brewery, Laterne, was located outside of San Luis in a town named Potrero de los Funes across the street from a lake sitting in the bowl of small mountains. Festive understates the atmosphere of the patio behind Laterne Brewing when we arrived early in the afternoon during their 5-year anniversary party. I'd say the mood was somewhere between Lollapalooza and Lupercalia: wild dancing with the occasional hose spray. Led Zeppelin and Argentinian pop favorites (probably from the 80s and 90s) came from the speakers and were amplified by the growing number of karaoke singers assembling on the impromptu dance floor. Turco, the brewery owner and a jubilant man with glasses and robust beard, saw us walking in and exclaimed: "Sara, Sam! Wow, you guys are just kids! You have no beer. What do you want?" I started with an English Brown Ale. The warm afternoon summer sunlight cut through the glass and tanned my hand brown while roasted coffee and hazelnut emanated from the glass and into my nose. A malty, caramel sweetness balanced the earthy, bitter finish. Sara had an IPA, and after a sip, I decided to continue my drinking session with a pint after the Brown. Completely dry-hopped with Bavarian hops, the IPA was golden in color, carried herbal aromas, tasted clean and crisp, and finished with a subtle bitterness that made it incredibly sessionable and easy on the palate. Turco, the quintessential extrovert, effortlessly carried the party while maintaining an attentive conversation with us. "My family came from Lebanon. I was born in Argentina and have lived in Cordoba, Bariloche, San Juan, and now San Luis. It's clean, quiet, and safe. And the water is good here." Inhaling hookah smoke every few minutes, Turco exhaled a cloud, passed the pipe to me and asked, "So, you want some carne? I saw you looking at the meat." We had just eaten leftover meat for lunch, but in Argentina refusal reflects bad character. "Of course," I replied. With claws of meat for hands, I became the subject of some unappetizing photos while managing to reach down and compress the previous food baby to make room for twins, and later triplets, and later quintuplets, and so on. Since arriving to Argentina I drifted as a pendulum between various degrees of convivial gluttony and consequently masochistic stomach aches. I will never forget Pedro's miming: using one fist as a wedge and an open palm as the hammer, pushing the remains of the previous meal down the digestive tract to make room for the next. I managed to fit it all in, but my stomach stretched to the brink of its elasticity and capacity. As the beer continued to flow the dancing became infectious (and compulsory), and before I realized it I was part of an energetic and fraternal dance party. When the hose came out and started raining down water I squirmed out of the pack, and Turco led us around the building to the first floor of his brewery, housing the fermenters. Arranged along the wall and reflecting brightly in the natural light coming through the windows, they had a peaceful and clean symmetry. Upstairs the 500 liter brewhouse operated at 83% efficiency (5th best in Argentina) and, by gravity, the beer travels downstairs to ferment and condition. 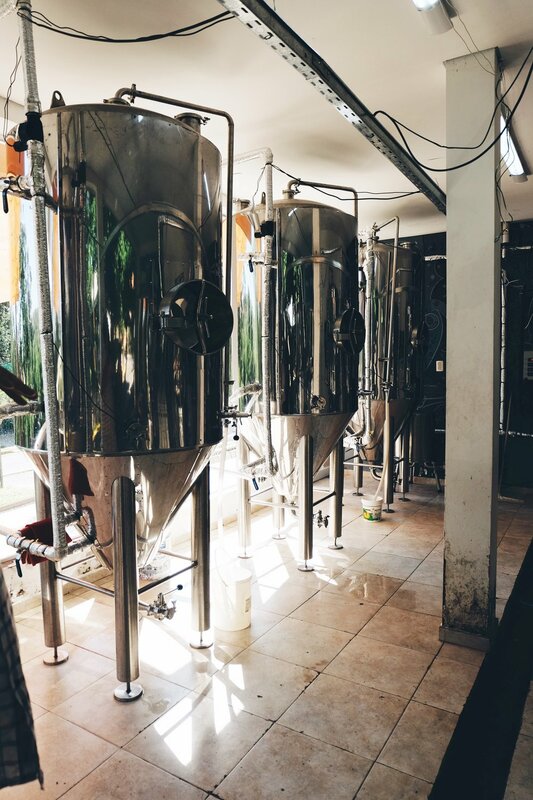 Turco is currently operating the brewery and several brewpubs throughout Argentina. He's a true businessman and my first impression is that there will likely be many more Laterne Brewpubs throughout Argentina in the near future; and, consequently, many more places to drink a delicious brew.